Matt owns a 1963 Beetle that's been around in his family for a couple of generations, and it has a tired old 1200 in it. I'd say it has maybe 20HP left in it, and it has high miles (over 150K as it sounds) and, this 1200 in it now is it's second motor. It's so under powered it's really cannot be driven. The goal was to find another motor to drop in. About a month ago we were on a Bus pick and found a yard with some Type I and II, and there was a 1600 dual port sitting on the ground, covered with a canvas tarp. We pulled the tarp off and found it's in decent shape, all ports capped off, tins recently painted, turned over, and didn't have any obvious end play issues. So Matt picked it up for $150 bucks - it's a complete, including 12v generator, flywheel, exhaust, etc. I don't know why this motor was on the ground - upon inspection...it's clean, no oil leaks and painted tins, it looks like it was cared for...but it was a gamble for sure. It wasn't apparent until we got the motor in the car, but the rear main is leaking, and that will need to be replaced. so back out it will come, and the seal will be replaced. This weekend we started on the project. First off, it's a 6V car, and while in this process we are converting it to 12V. We changed oil cooler seals right away and pulled the tired 1200 out. The generator had 0v output, so Wade had a spare so we swapped that out with a working used 12v generator. Bolted up the newer style clutch disk and pressure plate from the old to the new motor. There are transmission bell housing clearance issues we were unaware of, and that threw us off the first day. Try as we did, there was no way a 1600DP is going to fit an early transmission bell housing without modification. We found some info (a thread with mention to a sticky, but no sticky...and a YouTube video with decent info) on having to clearance the case, but no good pictures or information on how much to remove. 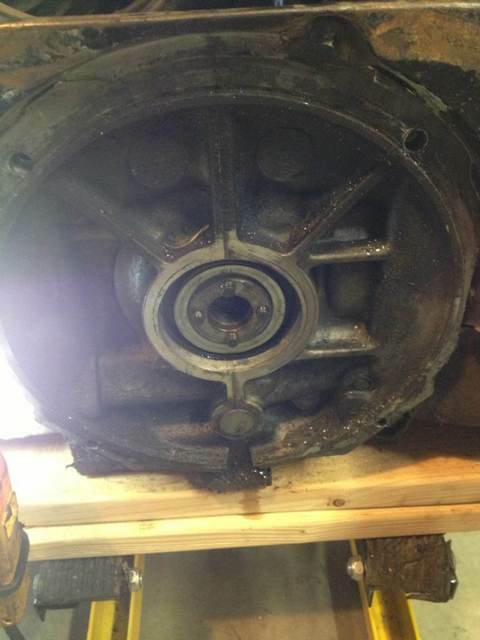 So we ground the obvious spots where the flywheel was hitting, and took a little more on the bottom, top and sides. It now fits in just fine, but may need clearanced further. The 12v conversion seems straight enough. We already have a new 12v starter, and battery...although we will need to get the proper size...the donor out of my Caddy was too big. All bulbs will be replaced and the wiper motor and flasher relay are on the list to purchase. Matt's documenting, but his pictures are blurry or too dark to post...maybe he has a couple that will turn out. Should be a good project when it's all done! I should add to that original post that without Wade, Cole and Matt the swap would have been much harder and less fun...although we were all beat at the end of both days. So a little update. Mike and I pulled the engine again to do some more clearance work and to install a new rear main seal and yes we did both the rear seal and the one in the flywheel. 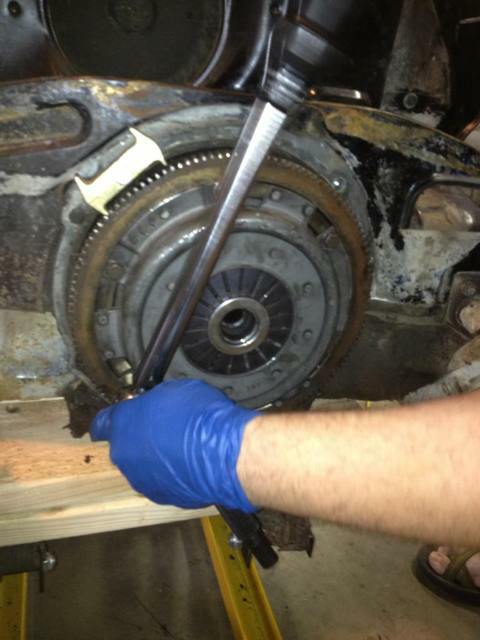 We did find that whoever did the last seal used rtv along with the seal and they didn't replace the flywheel seal. Then back on with the clutch with utmost precision. This is how much material was removed just today. Well after all that Mike and I reinstalled the engine, got the starter wired and now it's a starter issue. So tomorrow we will pull the 6v starter and try the 12v starter and see what happens. Well all I can say is that Mike and I got it running today. Mike had to get ready for a camping trip so we didn't get it finished. But wait! There's another issue. I think the fuel pump may be bad. Nice dudes! Now him and Jackson? I think? Can roll in style! YASHA7FOLD wrote: Well all I can say is that Mike and I got it running today. Mike had to get ready for a camping trip so we didn't get it finished. But wait! There's another issue. I think the fuel pump may be bad. Good to hear! Progress is progress. kompressorgolf wrote: Nice dudes! Now him and Jackson? I think? Can roll in style! Probably wont be rolling till late next week. The Ross's are headed out of town and any progress will be halted till he gets back. Wade and I teamed up and got the motor installed and running. As you can see above, Wade cleaned up the Solex 34 PICT 3. We got it installed yesterday afternoon, and I tuned it a bit, got it idling decent...but maybe still a bit on the rich side. But, it runs like a raped ape! Sounds badass too! It needs a few more things done...rear tin installed and the charging system checked to make sure it's doing it's thing. Matt will be a happy guy. Matt if you are reading this, let me know when you can come by. Maybe this week sometime?